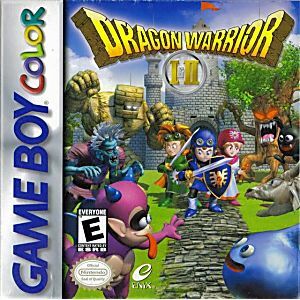 Dragon Warrior I & II Game Boy Color Game Cartridge Cleaned, Tested, and Guaranteed to Work! Two great games in one cartridge! I happened to stumble across this game at a mall ten years ago and, being a longtime fan of the series, bought it. My only regret is selling it sometime later, but I was delighted when I found it at Lukie Games, so I bought it again. As the name implies, this is a remake of Dragon Warriors 1 and2 for the NES. The stories are basically the same, but quite a few names were changed and certain features were added that weren't present in the NES incarnations, presumably so that they would be more true to the Japanese versions of the games. In Dragon Warrior I, you play the role of a young man who is the descendant of the legendary hero Loto (Erdric in the original American NES version), who has been tasked by King Lars of Alefgard to rescue Lady Lora from the clutches of Draco Lord and slay that sinister sorcerer to restore peace to the realm. 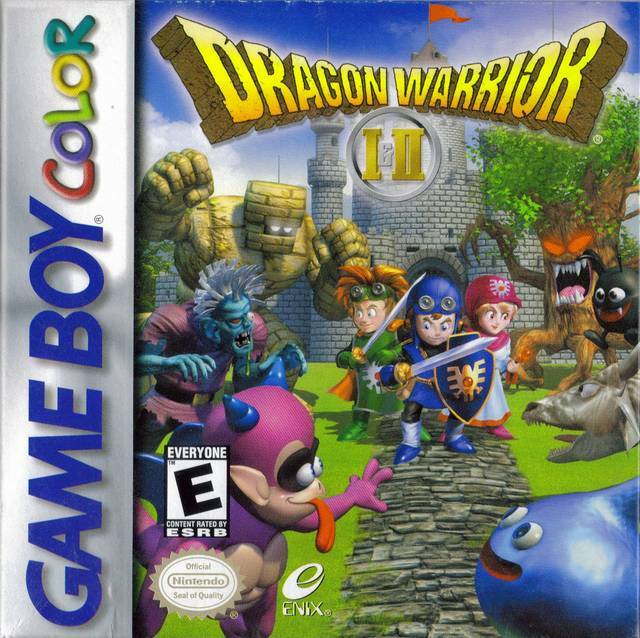 Dragon Warrior II picks up many years later, when the descendants of that hero must band together to thwart the plans of Hargon the Wizard, who seeks dominion over the world. Both games feature much improved controls over the NES incarnations. For instance in Dragon Warrior I you no longer have to select that ridiculous Stairs option to take a staircase, you simply walk up or down the stairs as you would in any other game. It's also much easier to talk to people and search for items, as the A button will perform this action automatically when the situation warrants it instead of you having to select those options from a menu. The B button brings up the main game menu where you use items and cast spells outside of battle. Audio wise the games are the same as the SNES remakes of these games which I don't believe ever saw a US release. That is to say the music from the NES games is present but includes those modifications which were made to the SNES versions. The sound effects are very much what they were in the NES games, complete with the high pitched battle cries, if that's what they were, of the hero and the enemies. One thing I like about these games, although there are many who would disagree, is the removal of the old English text. Half the time it was hard for me to figure out what someone was saying from one end of a sentence to the other. This version solves that problem. So all in all I think they did a good job on this one.